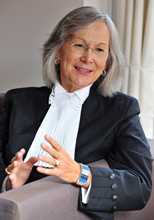 The Honourable Judge Marion Buller was appointed the first woman First Nations judge in British Columbia in 1994 and was appointed as chief commissioner for the National Inquiry into Missing and Murdered Indigenous Women and Girls in 2016. Prior to being appointed to the Provincial Court bench, Judge Buller worked as a civil and criminal lawyer (1988 – 1994). Judge Buller Bennett served as both a director and president of Canada’s Indigenous Bar Association and has been a member of the B.C. Police Commission and the Law Court Education Society. She was the Commission Counsel for the Caribou-Chilcotin Justice Inquiry and published reports and articles dealing with Aboriginal rights and legal services for First Nations in BC. Judge Buller was instrumental in starting the First Nations Court of British Columbia in 2006. Judge Buller received her bachelor's degree in anthropology from the University of Victoria, and went on to study law there as well. Judge Buller is currently resident in Port Coquitlam, British Columbia, where she sits on the Provincial Court Bench, but maintains band membership with the Mistawasis First Nation in Saskatchewan. In 2012, Judge Buller received the Distinguished Alumni Award from the UVic Faculty of Social Science. University of Victoria - Faculty of Social Sciences shared a post. Congrats to Hallie who is a 4th year UVic Anthropology and Human Dimension of Climate Change #uvic student.